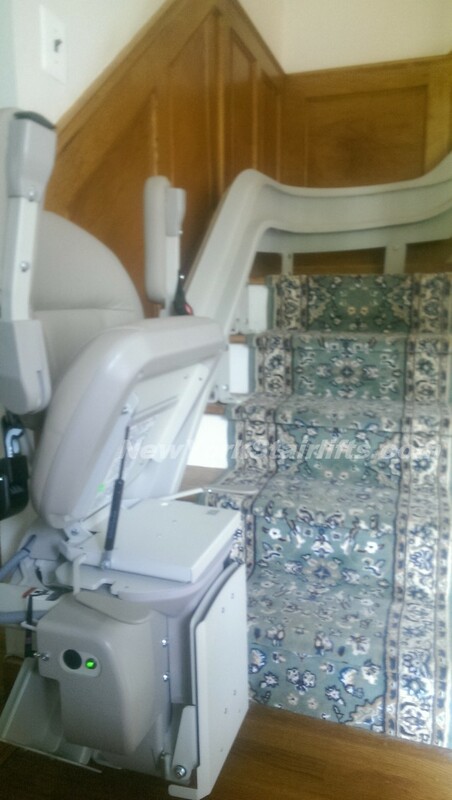 Stairlift parked and locked at bottom of stairs. 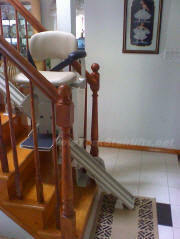 Green light means stairlift battery is fully charged and is safe for operation. 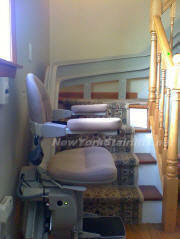 Stairlift safely parked at landing with seat up and secure, out of the way of stairway passage so others can easily walk up the stairs. 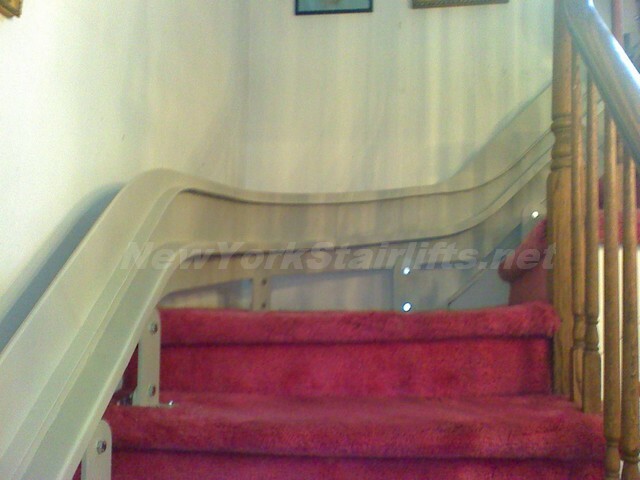 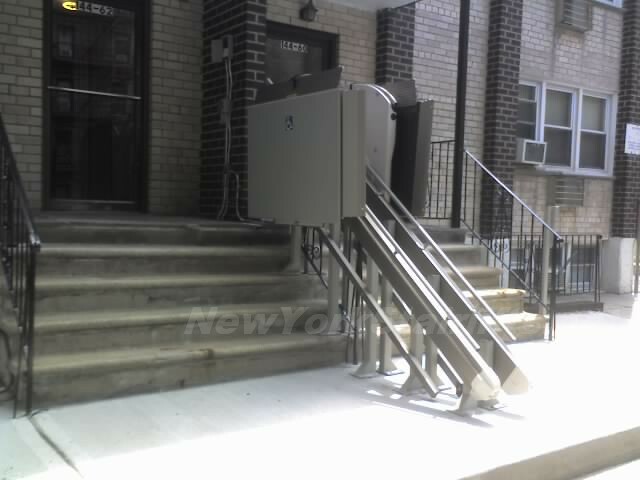 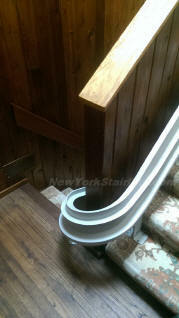 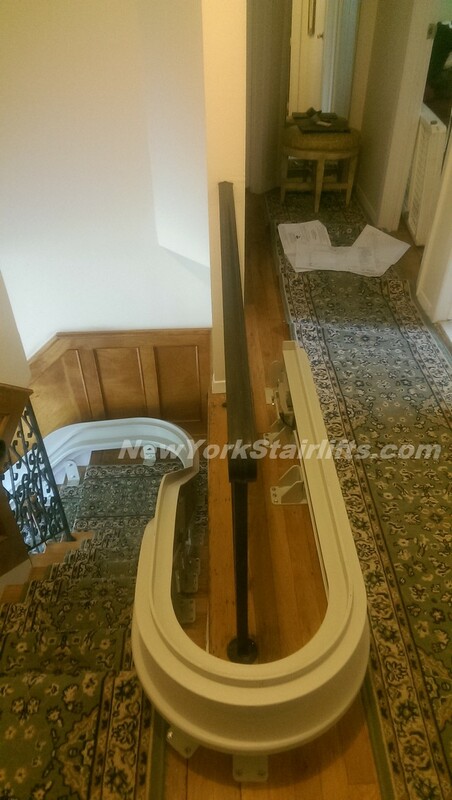 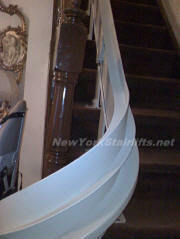 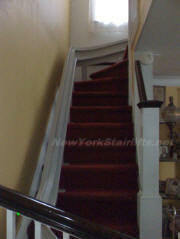 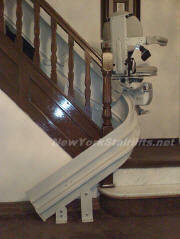 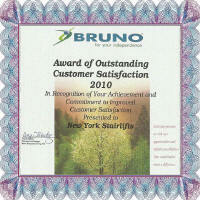 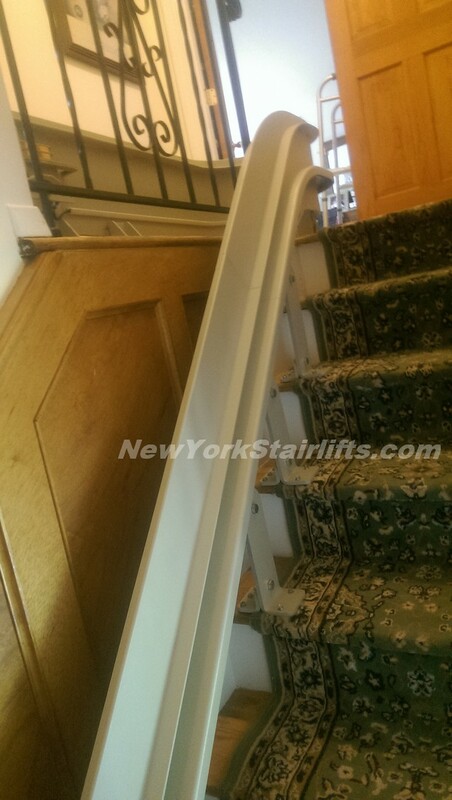 Notice the unique curve in rail, custom designed by NY Stairlift professional installer. 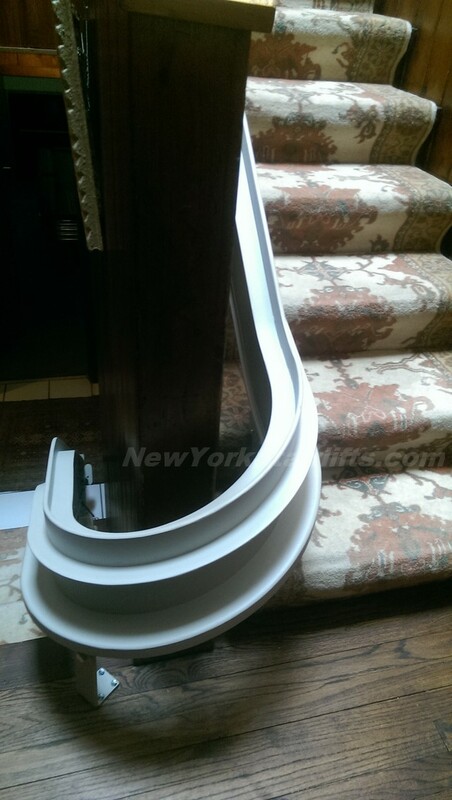 Close-up of custom curved rail. 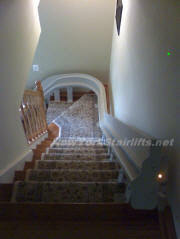 Notice how the color blends with the wall. 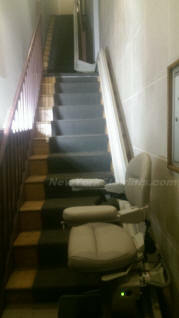 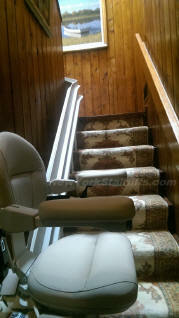 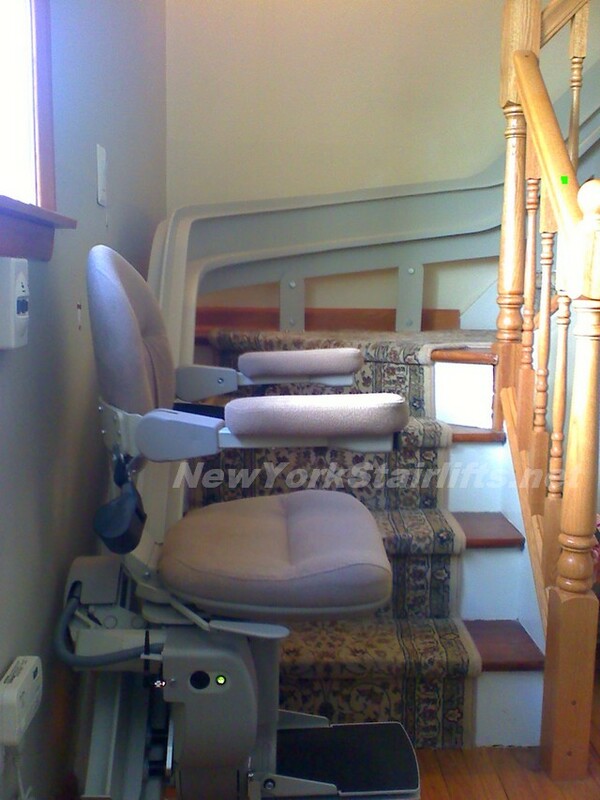 Professional installation conforms the curve to the wall while insuring a smooth ride for the stairlift. 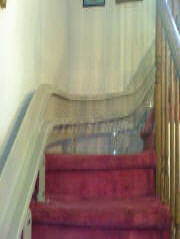 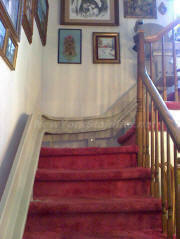 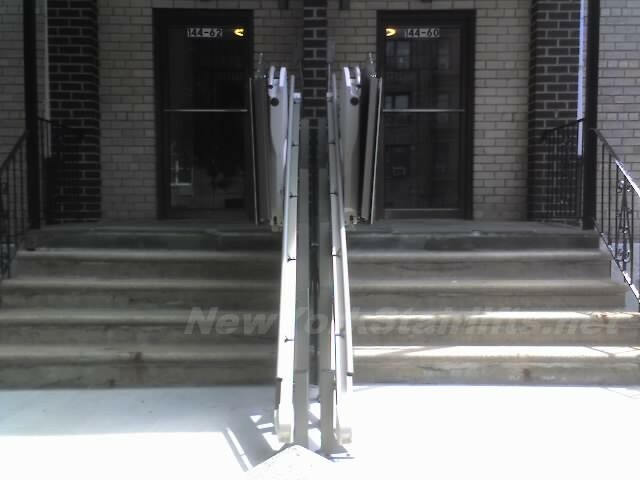 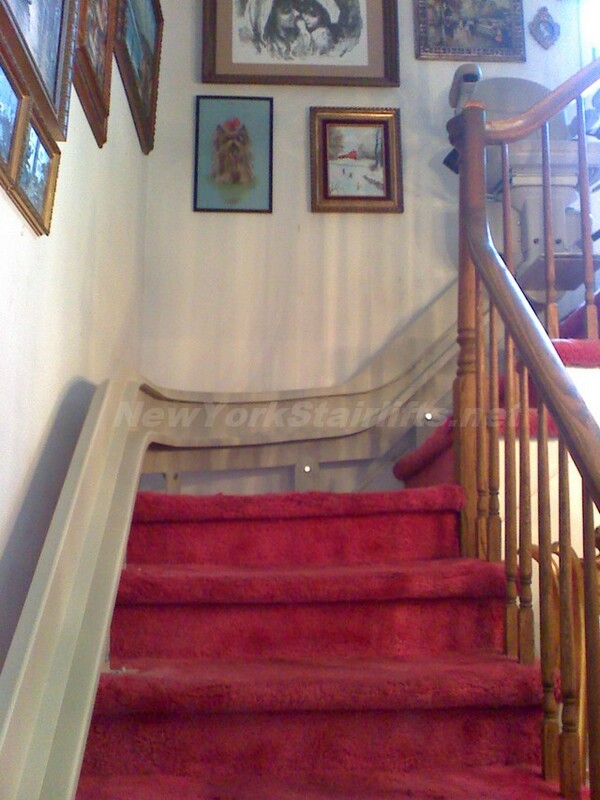 Notice the neat mounting of the rail to steps, which are exactly to customer's specifications. 180 degree turn at top so travel ends away from steps. Cleam install of a curved home stairlift. 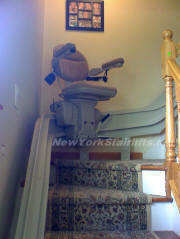 Notice the stairlift call control on the column to the left. 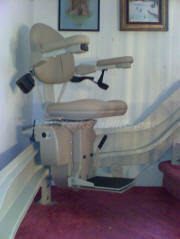 The call control can be placed in any location that makes you comfortable. 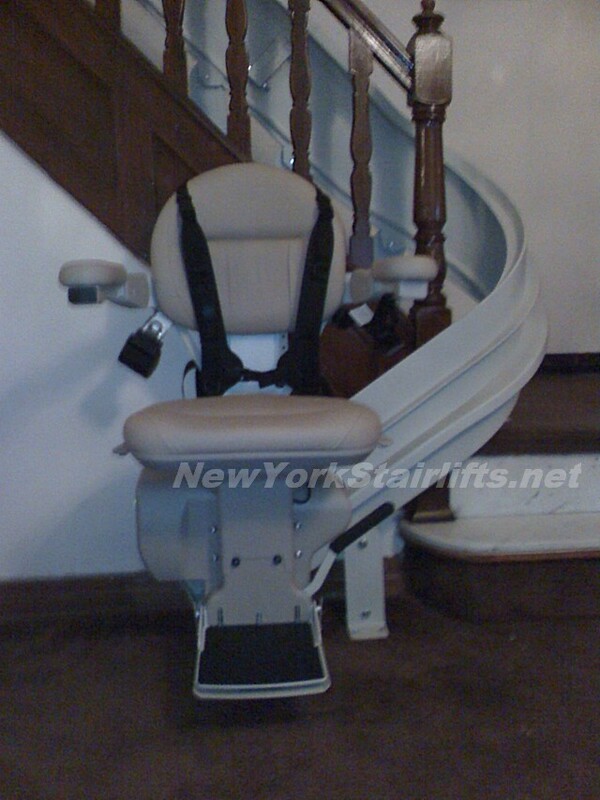 Curved stairlift. 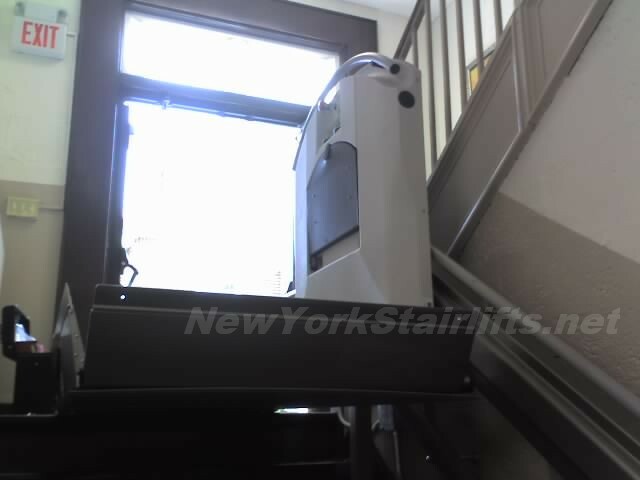 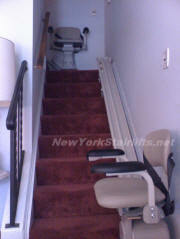 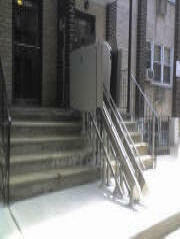 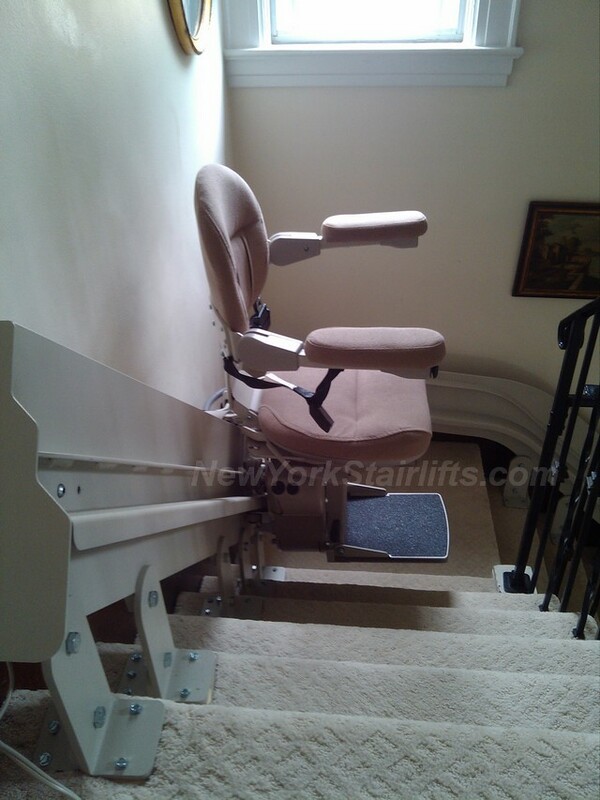 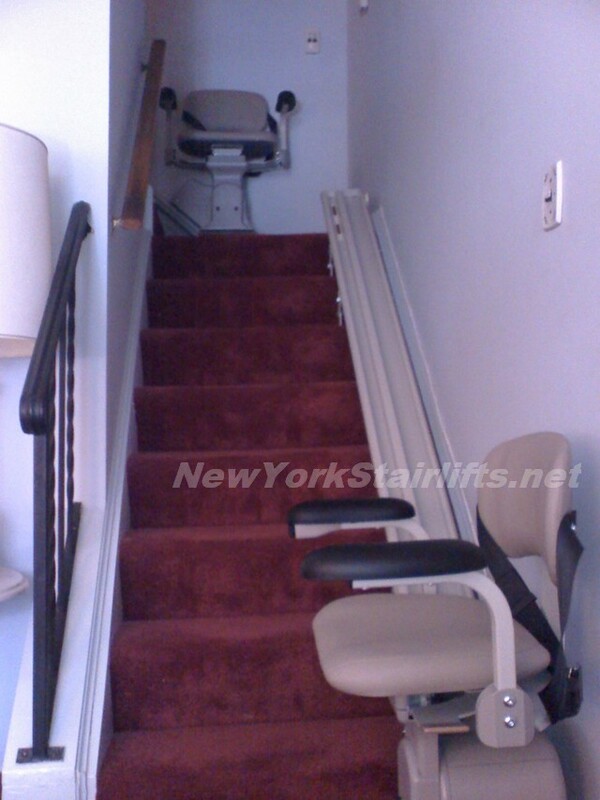 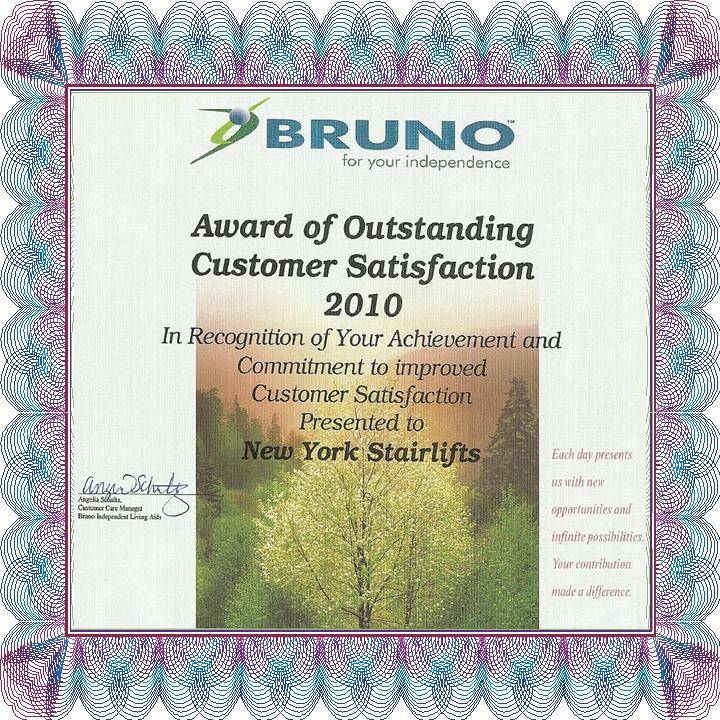 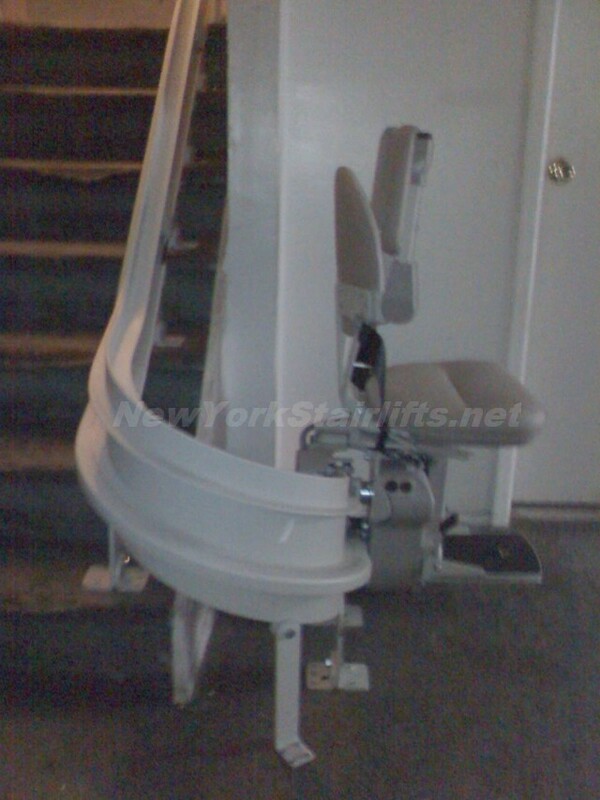 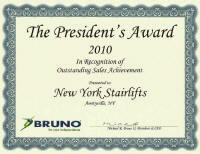 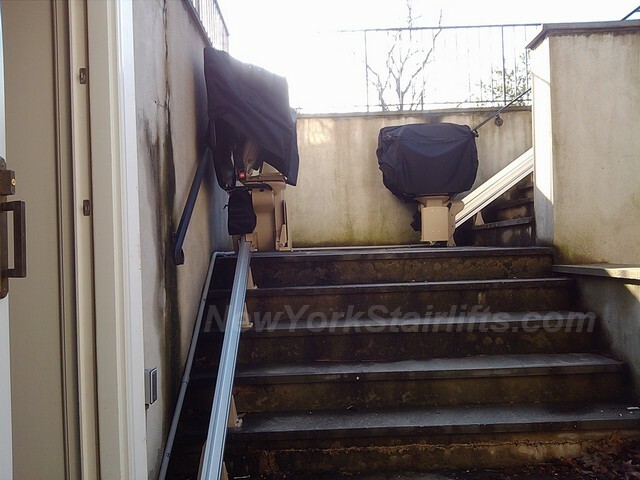 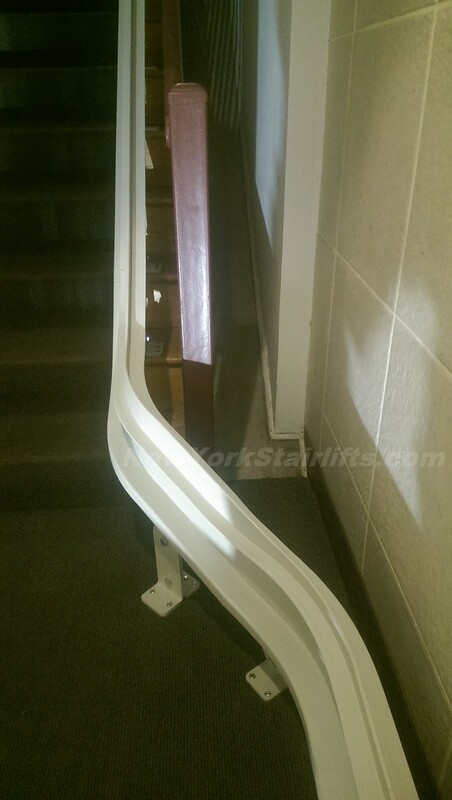 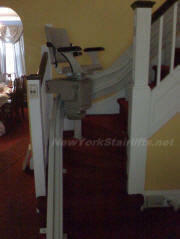 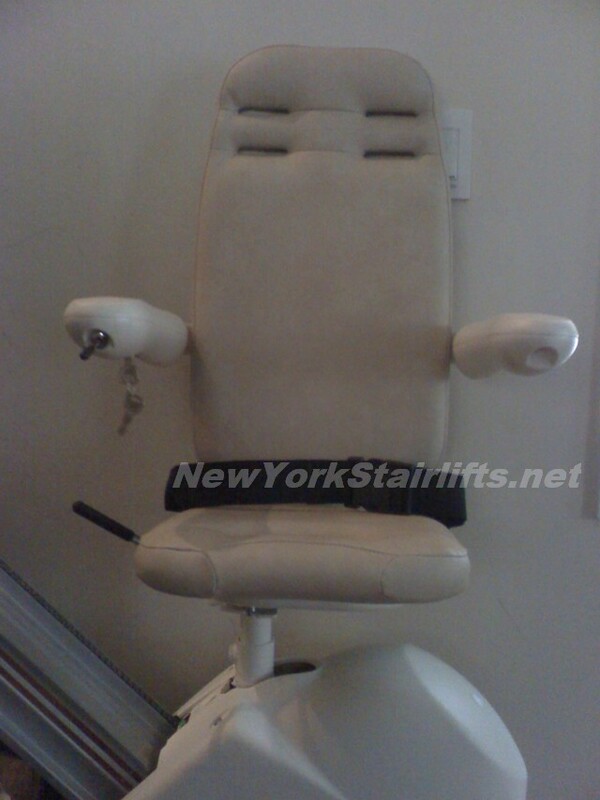 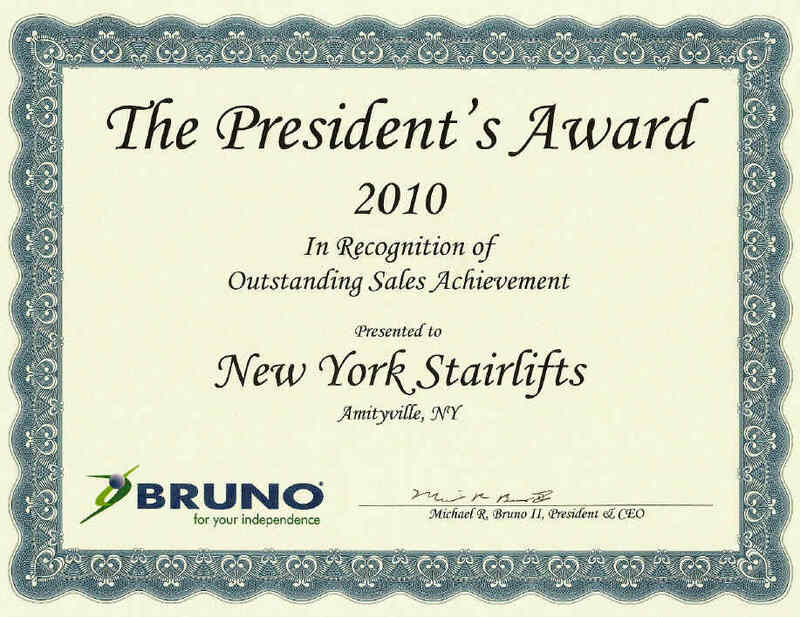 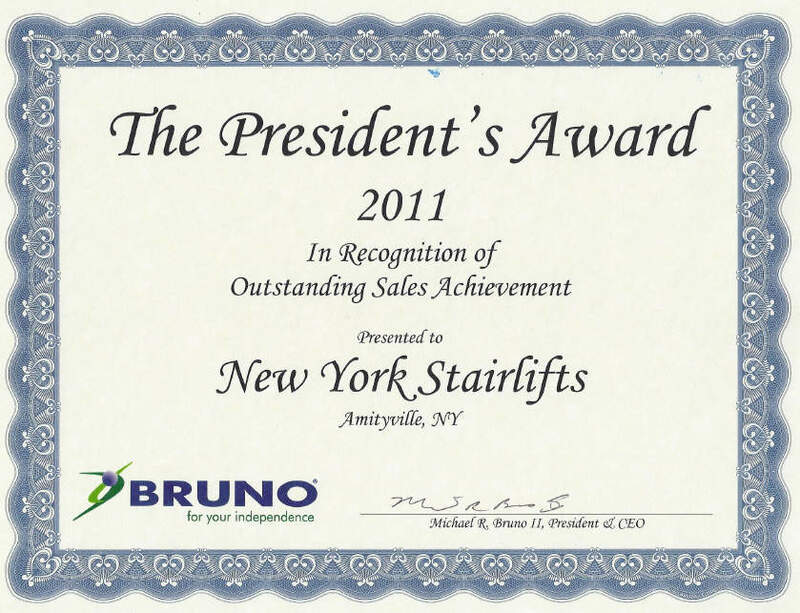 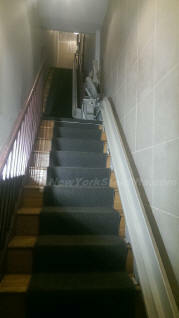 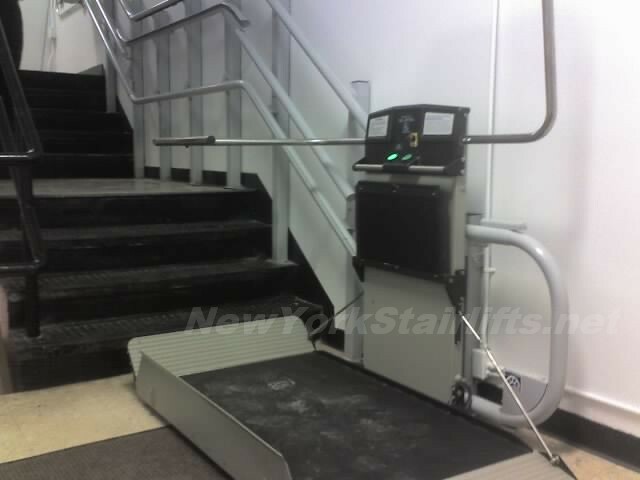 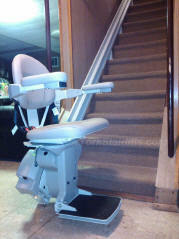 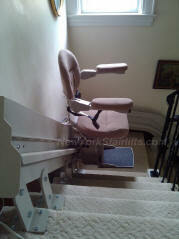 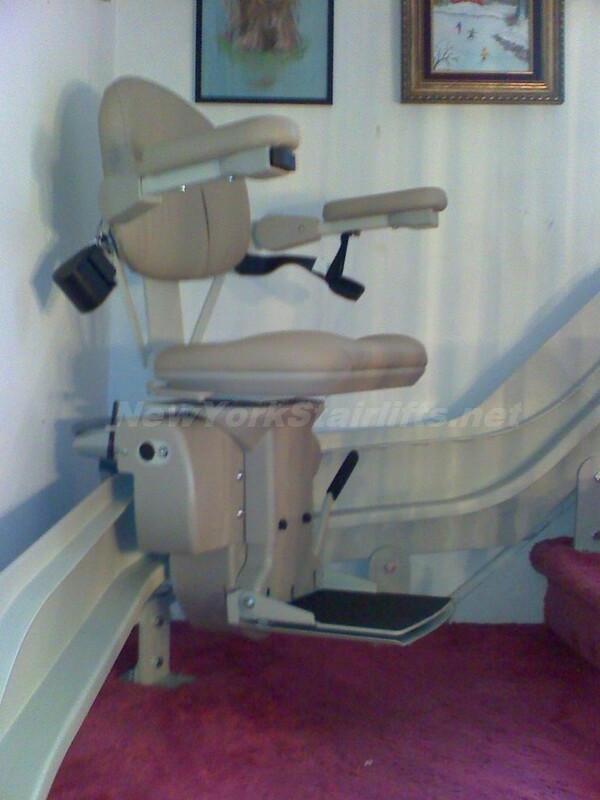 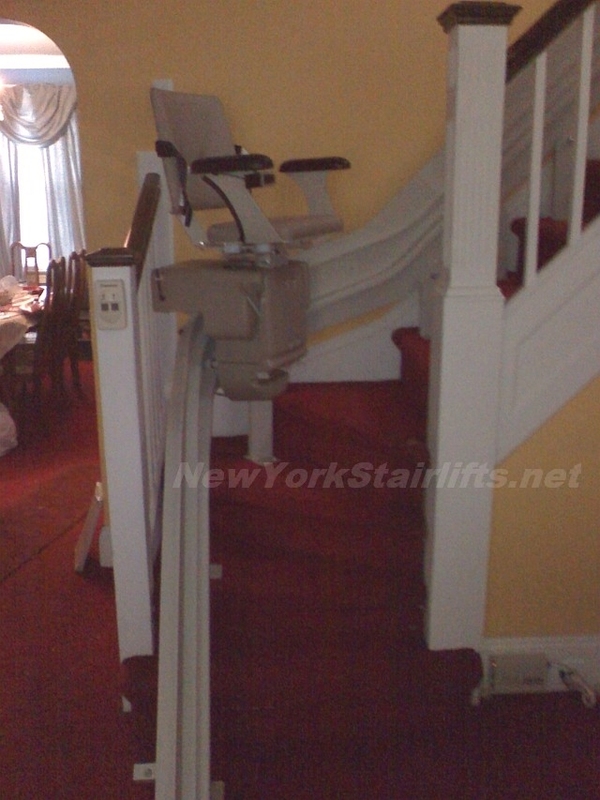 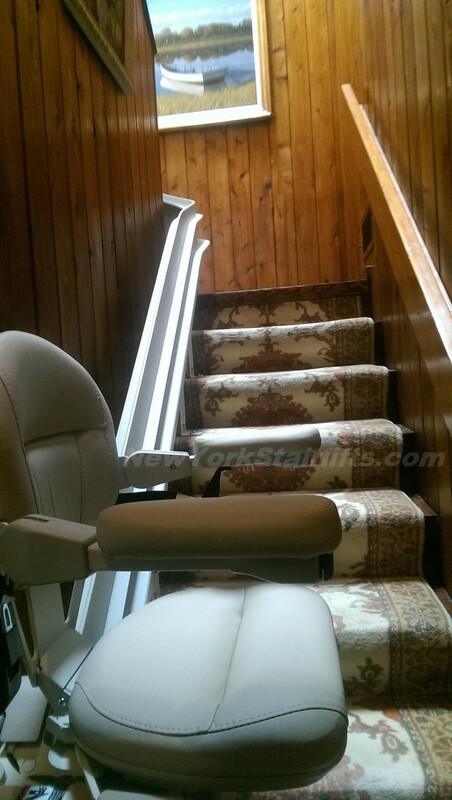 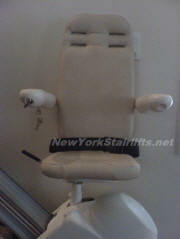 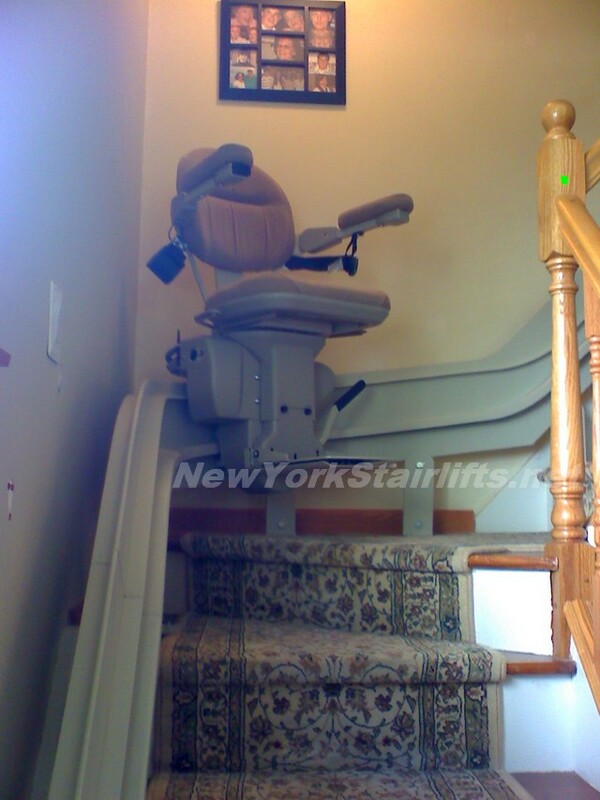 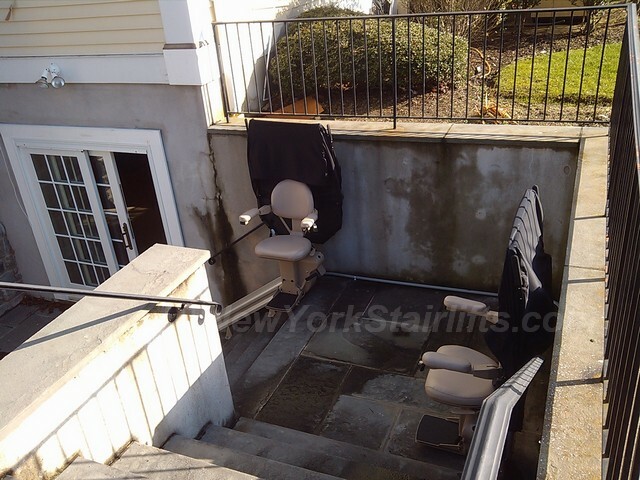 Notice the stairlift easily sits on a track made of thick, reinforced elevator quality steel. Curved stairlift, outside rail. 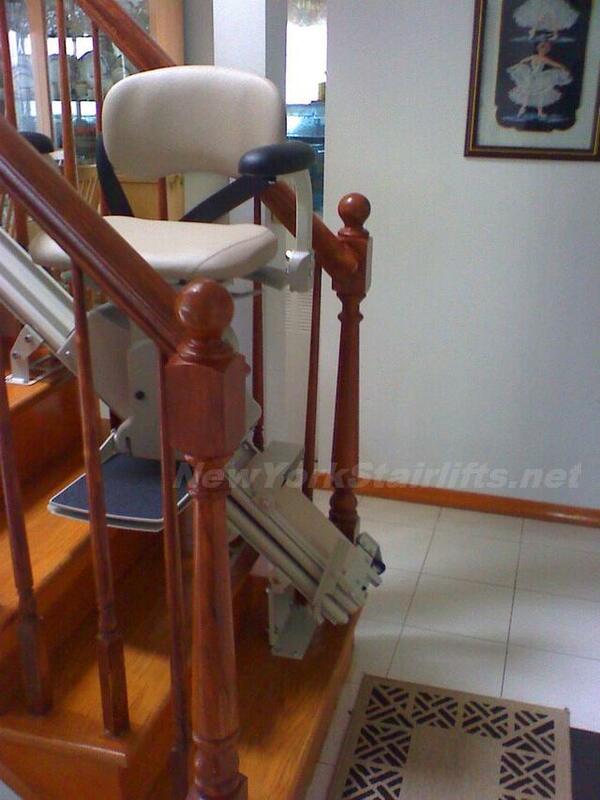 Stairlift is in the downstairs locked position, safely out of the way. 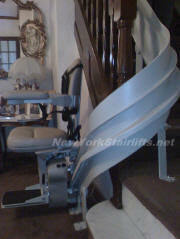 Curved Stairlift, inside rail. Notice how securely the stairlift attaches safely to the track. 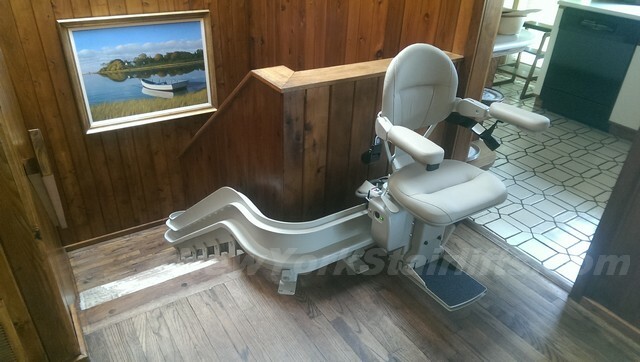 Curved Stairlift at the landing. 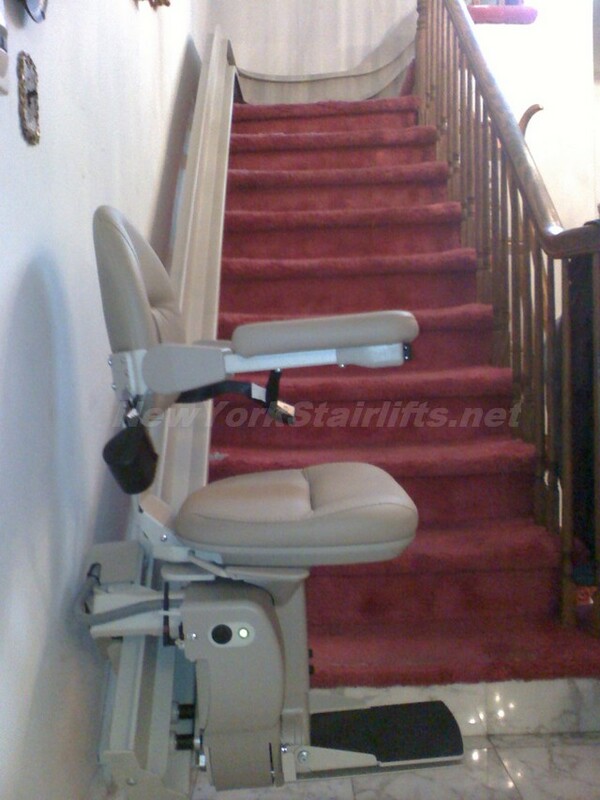 Once in motion, the stairlift easily clears the bottom of the steps. Curved Stairlift. Notice how the gentle curve of the track easily fits the contours of the stairs with safe, rounded surfaces. Curved Stairlift, closeup of landing. 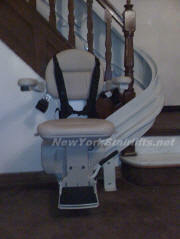 Safe and secure, we are experienced in installation of the adjustable child seat. 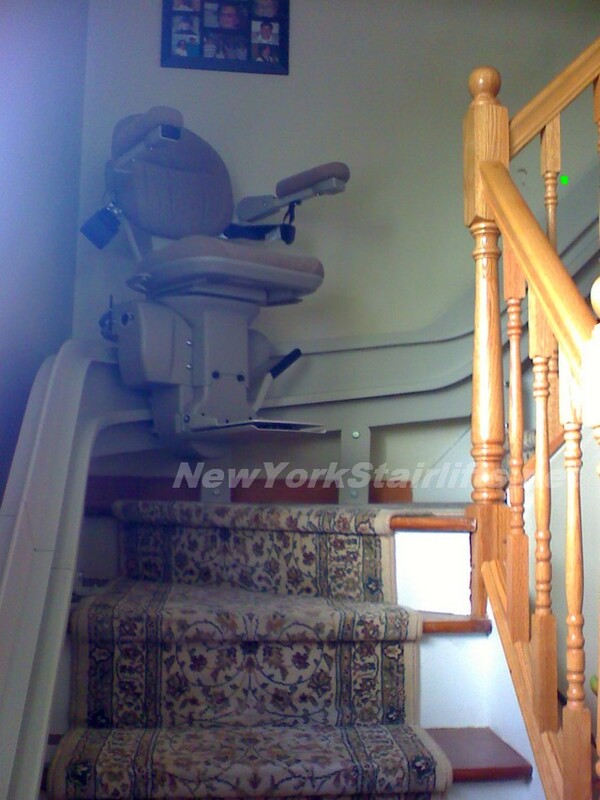 Note the padded belt. Comes with a lock to prevent unauthorized use. Note the heavy-duty elevator quality materials. 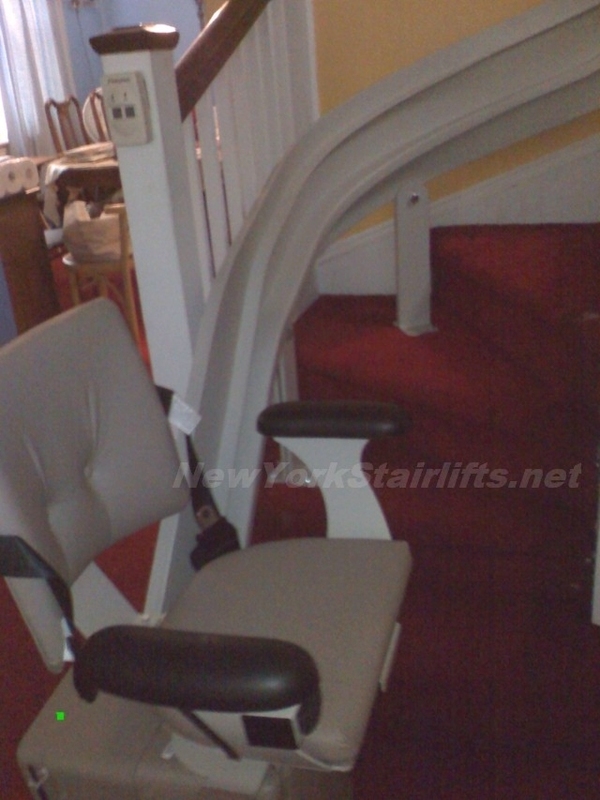 Curved stairlift on landing. 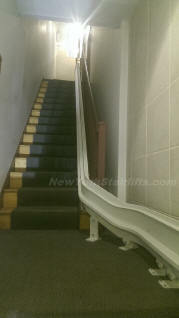 Note the safe clearance from the wall. Fully installed railing is attractive and blends with the house's asthetics. Stairlift Install - A Double! 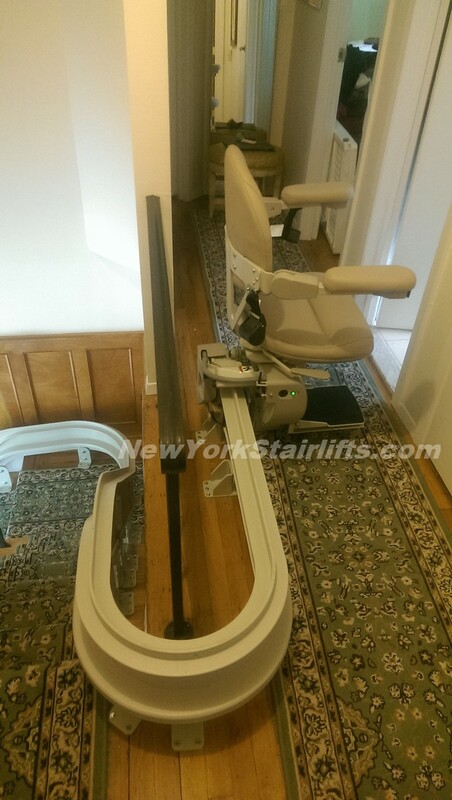 Double stairlift install. Perfect for especially narrow stairwells.